Folder: ason vs. Baskin. 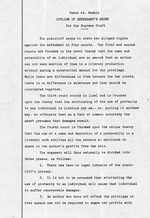 Outline of Defendant's Brief for the Supreme Court, typed ms. 3 p. This item was received with the Oliver accession (1998) of MKR-NB correspondence. without paying a substantial amount for the privilege. court presumes that damages result. share in the author's profits from the sale. writing of a literary production. The recent origin of the doctrine. The distinction between libel per se and libel per quod. does not constitute a criminal offense under the laws of Florida. against a man and a libel against a woman. the recognition of its therapeutic value. nor have we been able to find any.